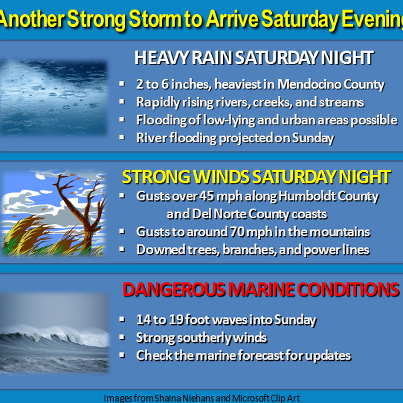 Photos, rainfall info, and high water info from the National Weather Service – Eureka. Video by Mariah Gregori: Thanks Terri. It looks like the road has been reopened at least temporarily so people are getting their cars out before this next rain. Mariah Gregori: I don’t know if it is mile marker 10. It is about 4 miles from the Honeydew store towards Panther Gap. ~from KMUD.org and KMUD News Facebook group. Road Conditions at 10:45 a.m.
Well we made it through the first round of storms with little to no damage in the immediate area. Unfortunately, this storm battered us badly. Many trees down and flooded roadways, slides and mud flows. Kym has a report here. And much more info coming in from the comments area as people get out and see what the damage is, so keep checking back on this one. I talked with Marty Messenger, County Roads Supervisor, to get the most local updated info on Sunday morning at about 9am. Briceland Thorn Road is passable (but flooded) at the Whittemore Grove bridge. Camp Kimtu Road is closed – the river is over the road. They are keeping the bluffs clear, but it’s muddy there. They are finishing up a slide on Sprowel Creek Rd. The roads are open from Whitethron and Ettersburg into Redway and Garberville. I will update this as news comes in. This entry was posted in Roads and tagged Briceland Road, Ettersburg Road, flooding, hazardous weather, winds. Bookmark the permalink.